This badge was issued to Tushar Takate on 10 Jul 2018. 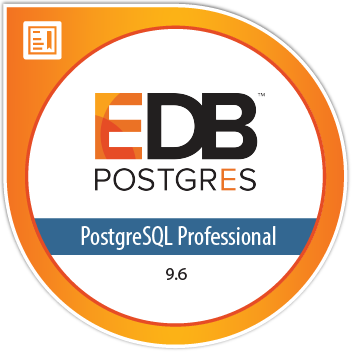 Earners of the EDB Certified Professional badge for PostgreSQL 9.6 have demonstrated their advanced knowledge in administration of PostgreSQL open source databases. Earners have advanced experience in PostgreSQL database administration and have displayed competence in performance tuning, streaming replication, connection pooling, partitioning, extensions, upgrading, and more.